Itchmo: News For Dogs & Cats » Blog Archive » Is Your Pet a Bed Hog? Is Your Pet a Bed Hog? It’s a question on every pet owner’s mind: How do I get my bed back? We’ve all had those sleepless nights where our pet took up most of the bed and all we had was a sliver of space, and if you even dare move, your pet will growl like crazy and kick you back to the small space that your pet has allotted to you. 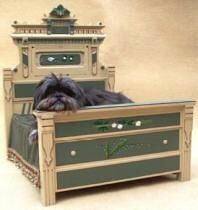 Maybe your pet just needs his own bed that looks just like yours with his own mattress and headboard. Pawnique sells luxurious pet beds that look just like real human beds ranging from $225.00 to $1,020.00 (yes, we said $1,020 — for that amount of money, you should be able to sleep in that bed). One bed even has drawers for “treasures”, so if you can’t find that missing shoe, it may be in the treasure drawer. Good luck and hopefully you’ll get a good night’s rest. This entry was posted on Thursday, May 24th, 2007 at 3:52 am	and is filed under Cats, Dogs, National Dog, Cat & Pet Info, Products & Services for Cats & Dogs. You can follow any responses to this entry through the RSS 2.0 feed. Both comments and pings are currently closed.